When you are a small business or a online business like us, with your employees or volunteers residing in different parts of the world, email serves as your main means of communication and collaboration. Be it discussing on some subject or sharing some important files or information, most of us tend to rely on emails. But have you ever dreamt of a system which is cloud based and provides you a complete solution to your team collaboration problem? This is where Bitrix24 comes in. 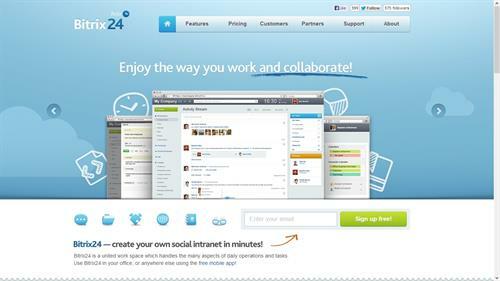 Bitrix24 is a collaborative software project management cloud based software. It enables you to collaborate with your coworkers, chat with them, track your progress, schedule your tasks, assign tasks, share documents as well as gives you a customer relation management (CRM) system. This is just an list of few Bitrix features which we will be describing in detail in this review but first some introductory details which you will find useful when you sign up for the account. 1. You can make up free or paid accounts with paid too having many variants depending on the number of users your Bitrix24 account will be having. For those just who require just 12 members in their Bitrix24 account, the free version is sufficient. You have a look at the pricing and features of account here - https://www.bitrix24.com/prices/. 2. If you plan to sign up for the for the free or standard account then you will get a subdomain intranet like just like the way we got it. So, choose the name carefully if you want to avoid the hassle of making another account. 3. Sign up is simple, just give you email account and get it verified and voila! You have your Bitrix24 account ready for use. 4. Fill in your profile information and invite other employees of your company. Once they join up you can categorize them according to their position like Marketing, Advertising, Sales etc. you can also create your own new group. Similarly, you can also delete a group you feel is not appropriate for your company. 5. The members of these workgroups can get into discussions, share files and the admin can also set for the group. 6. The users can set their own subscription settings for different activities, that is you can select if you get a mail if a photo is uploaded or if a task is allotted. That is,users get a lot of flexibility with the features of Bitrix24. 7. The important thing to note here is that is you are not an administrator and somebody, probably your boss, has invited you to collaborate on his intranet, then your boss can set the privacy settings of a group in such a way that you will be able to see the activities of only that group of which your boss has authorized for. 8. With Paid accounts you get the facility of Extranet which enabled your clients or partners to participate actively in the proceedings of the project. 9. Mobile app of Bitrix24 for iOS and Android is also available which helps you to keep connected to the progress in your company even when you are on move. Now let's start with the features of Bitrix24. The first thing you will see once you log in your Bitrix24 account is the activity stream. Depending in your level in Bitrix24 online intranet, you will be showed all activity related to you. If you are the administrator then you will be shown the activity of all employees in Bitrix24. If you are an employee and a member of one or more Groups, then you will be shown the activity of that group. This means that if you want a group to have complete privacy or want your customer group to not have access to the activities of your employees, then Bitrix24 provides you the perfect solution. 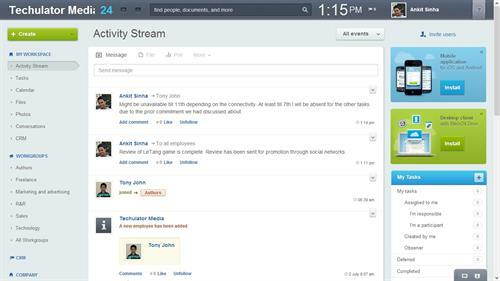 The Activity Stream tries to give you your Facebook timeline but of your workforce. You can start a discussion while selecting with whom you want to discuss and making the discussion invisible to others. You can upload files or images, start a poll or even make an announcement. 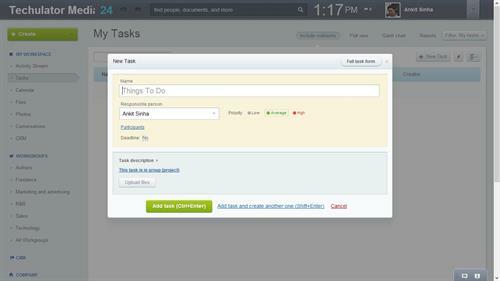 Here you can create or manage tasks. To get the work done on time and assigning it to the right people, Bitrix allows you all. You can name the task,delegate the responsible person for the task, set its priority level, add team members for the responsible person and also give a deadline for the project. As the work goes on of the project, you can even watch its progress if you ask your employees to keep you updated in the form of a Gantt chart. Meanwhile, the Task window will show you if the task is in progress, is to be taken up or has been completed. Calendar is an extension of Task feature. Here you can set the tasks for yourself and your employees in advance. Just select a date and set a task. And the best part is that you can sync these details with your mobile or through Outlook. You can also check the status of older tasks, whether they have been completed or not or what is their present status. 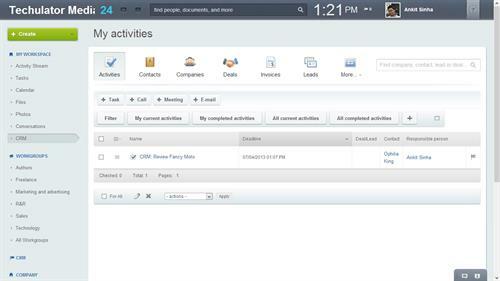 The Files section give you a cloud storage to share files with your team members. With the free Bitrix24 account you get 5 GB of free space, for standard Bitrix24 account 50 GB, for professional you get 100 GB and for the Enterprise Bitrix24 account you get 10 GB of space per user. You can also edit your Word or Excel files you have uploaded on your Bitrix intranet but only with Internet Explorer or Mozilla browser. Also, the file editing is not like Google Drive or Skydrive word editing where the files is opened in the browser itself, rather the file is downloaded on your hard drive, which means you need to have a supporting software to open those files and when you save your changes and save the file, the file on your Bitrix24 account is also updated. Bitrix24 has a Drive app just like the Google Drive desktop app which syncs your files between the Drive folder on your computer and files in your online Drive account. Bitrix24 Drive software has the added feature of updates notifications as well as integrated messenger service. You can upload your company photos in the Bitrix24 drive but make sure to not upload too many images otherwise you may end up filling up the online storage space of your company Bitrix24 intranet. Conversations has the same functionality as your Status update in Facebook. You can choose a specific group or specific people with whom you want to have some conversation. They can continue the conversation by replying to you just like in Facebook. And just like in Facebook, you can add links, photos, videos or files in your conversation. CRM stands for Customer Relationship Management (just in case you didn't know!). 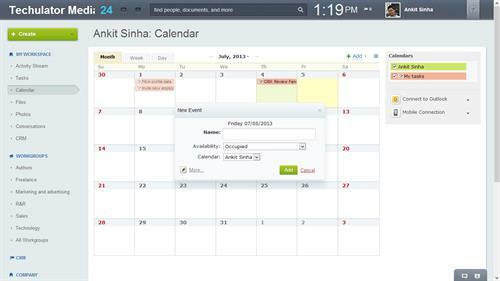 Bitrix24 provides very basic CRM tools to help you keep a tab on your deals, events, sales record, products, invoices etc. For example with each lead you can keep a record of conversation with them, add meeting notes, record their contacts or even personal details. Bitrix24 CRM activites will help you track your Current activities, Completed activities and all Activities. However, for mass emails you do not have graphical templates here. Is Bitrix24 good for you? Bitrix offers a wide variety of tools which make collaborating with your team members very easy. Tracking the progress of your whole team with the activity stream, ease of locating any file or conversations, setting tasks with explicit deadline and many more features help streamline the working of your team. You would definitely find your productivity to increase many folds with services like Bitrix24. The free account is available for 12 members and gives you a good opportunity to try most of its basic features. Though some features like Extranet and work tracking documents are not available with the free version, but the basic features give you sufficient options to check the functionality of this online intranet and upgrade according to the needs of your organisation. One thing we would like to highlight is its shallow CRM tool. If you need a sturdy project management solution which can provide you features like social media management email templates then this tool is not for you. However, for small to medium scale industries, we would suggest Bitrix24 as an ideal solution. It is an online tool which strive to increase your organisation productivity by streamlining the work environment of your organisation.